As the week progresses, Ben is getting sadder and sadder. There are suitcases on the guest room bed, and we are filling them up with the things we'll find most handy for a wedding weekend in Las Vegas. They fill him with uncertainty: Are you LEAVING me?? Do I have to RIDE in the car for a million hours? Am I going some place where leashes are REQUIRED? What is happening to my world? When suitcases appear, Ben kicks into his best worry mode. He shadows us throughout the house. . . he plops down loudly and reproachfully on the floor -- a precise three feet away -- if we take a minute or two to watch television or work on the computer. . . he fixes us with deep, inquiring, piercing stares, plumbing the solutions to the Mysteries of Life -- or at least why his Two-Legged People behave the way they do. And just to rub things in, I leave you with this image one more time. Welcome to our world. Is this wedding weekend worth the canine guilt? Absolutely. A boy young man we coached and shared in the many vagaries of youth is getting married. He is a our unofficial third son -- and it is a privilege to be part of this next stage of his life. Score card: The groom is third going left to right -- the one with the bowl cut. Oh wait. They all have bowl cuts. the first two left to right. Will Ben be sad while we're gone? Maybe a little, but there are good things coming his way. He spends a couple days with his most favorite family (aside from us I hope) and then goes to The Lake for the weekend. I see many walks in Ben's future. Dear Mr Ben, it's okay! You're not going to the gulag and you're not going to be left at home alone to cook for yourself. Maybe they'll even bring you something nice from Vegas like a glitzy collar! Your sad face rocks. Teach me? 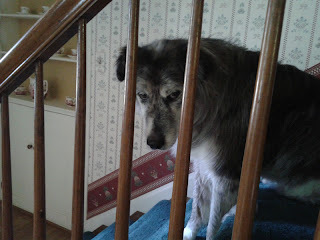 I've just popped across from BlogPaws wordless Wednesday blog hop. Hi Ben thanks for the photos, i will have to practise on my sad face. Try not to be to sad a little birdy told me you're going to the lake for the weekend. That will be nice. Awe, just look at that sad face. It's okay Ben. I'm sure you'll have fun while they are away. Just look at those faces he's giving you! Could he lay the guilt on any thicker! Thank you very much for this useful information.Please keep on blogging.I am looking forward to read your next great article..